Do you have a newly licensed teen in your life? While the thought of your teen being able to drive on their own can be nerve wracking, there are lots of things you can do to keep them safe on the road without being in the passenger seat. At Buyer’s Choice, we understand the importance of safety and utility when purchasing a new vehicle. 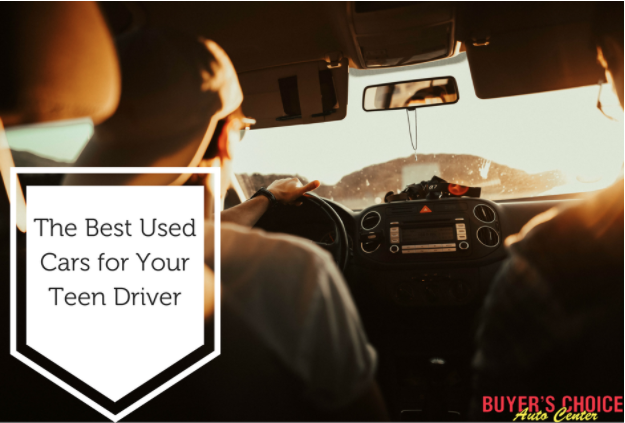 We’ve compiled a list of some of the best used cars for new teen drivers. Take a look! The Accord deserves to be first on this list for it’s solid ‘best all around’ reputation. For years the accord has been awarded 5 star safety ratings making it an obvious choice for your teen. In addition, the car is one of the most fun to drive in it’s class and has a spacious, comfortable interior with consistently high ratings in fuel economy and affordability. Models from 2008 on and with 4 cylinders come the most highly recommended. The Ford Fusion gets better and better each year and has respectable rankings in safety, handling, reliability, fuel economy and affordability. If your teen is active in extracurriculars the Fusion is a good choice. With a spacious trunk and interior there’s plenty of room for equipment, teammates, and everything in between. Hybrid models that are from 2010 and later with 4 cylinders are recommended. The Passat is a competitive midsize sedan. Over the years the interior of the car has gotten more spacious for both front seat and back seat passengers. The trunk is also spacious and the European design is known for it’s smooth handling and appealing design. Good fuel economy, high ranking in crash safety and a quiet comfortable ride are also great perks of driving home a Passat. The price range is also very reasonable. Non V6 models from 2006 on are most recommended. Although the subaru is a little more on the pricy side for a teen’s first car, it’s place on this list is secured in the fact that it has superb gas mileage and safety features. This midsize SUV also has a nice spacious interior. If your teen has younger siblings that you want them to start helping transport now, the Forester is a great option. Also, any teen that has an adventurous side will appreciate the Forester’s utility features. Non Turbo models from 2009 or later come most recommended. RAV4’s consistently rank in top spots among small SUV’s. Safety features are great and rank highly and the car’s interior is well liked by it’s owners. This SUV is on the small side but packed with great features across a large range of models. The RAV4 is also highly and consistently praised for its handling abilities and is reported to drive smoothly and swiftly. Models with 4 cylinders made after 2004 are most recommended. If you have a teen who's ready for a set of wheels give us a call at 843-225-7044. Buyer's Choice can get almost any car within 72 hours if it's not already on our lot. We care about you and your family and know that a quality vehicle is important. Give us a call and let us help you find the right one.